This is a Sponsored post written by me on behalf of BuildDirect for SocialSpark. All opinions are 100% mine. I'm so embarrassed to admit this but our outdoor area is in a terrible state. The table is our old kitchen table that I had hoped to paint one day (that was two years ago). The chairs were given to us by a family member. I had planned on painting them as well but we soon realized that they were not very sturdy. Two of them broke within the first month. The others don't get much use unless we absolutely need them. The small kids table is the only thing out here that has been painted. In fact it is covered in multiple paint spatters (as well as craft glue and marker) since it is mainly used for the girls art and craft projects and is currently being used to display their rock collection. When we first bought our house we had dreamed of having many barbeques out here with friends and family. However, our indoor projects took priority and the back yard was placed on the back burner. Thanks to BuildDirect’s Find It. Keep It. Giveaway I now have a chance to find and win some new products to makeover my outdoor living room!!! 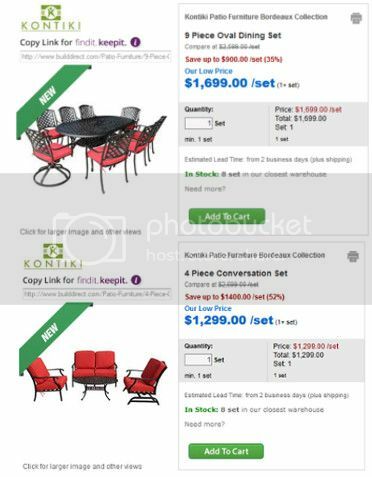 The two pieces I picked our the 9 Piece Oval Dining Set and the 4 Piece Conversation Set. I think these pieces will be perfect for our family. Having two separate seating areas is important to us so that we have a place for the kids to hang out as well as a separate area for the adults to have a conversation. 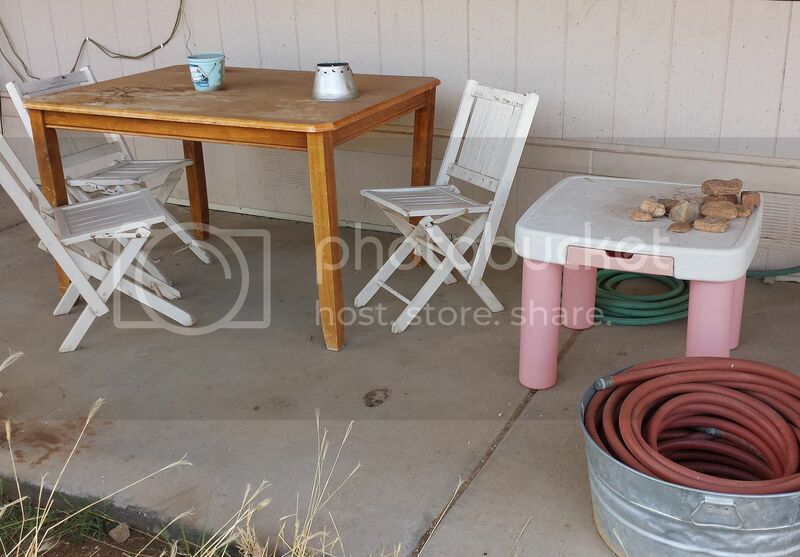 The dining table is perfect for outdoor eating or playing a game of cards, while the 4 piece set would be great just to lounge around with friends and enjoy the Arizona weather. Would you like to enter your own area for a chance to win?? To learn more about BuildDirect’s Find It. Keep It. Giveaway please watch the Find It. Keep It. how-to video. What exactly is BuildDirect’s Find It. Keep It. Giveaway? BuildDirect’s Find It. Keep It. Giveaway is your chance to find and win new product allocated to our giveaway event. If you win, we also ship it to you for free. To participate, simply visit http://www.builddirect.com/finditkeepit/ and follow the entry instructions. From the entry page on the BuildDirect website (www.builddirect.com/finditkeep…) you can click on the “enter now” button and follow the steps to complete your entry. How can you enter your own space in the Find it. Keep it. Giveaway? 1. Visit the Giveaway page and click the “enter now” button. 2. Begin by filling out the entry form with your personal information (see how we protect your personal information below and in the Official Rules). 3. Upload a photo of the room or outdoor space that you would like to transform, consistent with the theme for the applicable week (each week is a “Draw Period” and there are eight (8) Draw Periods during the Giveaway). 4. Follow the link to the “New Products” section of the BuildDirect website and find your two (2) favorite New Products that you would like to keep to transform your room or outdoor space, consistent with the theme for the applicable Draw Period. Outdoor patio furniture and fireplaces may only be selected for Draw Period 1 and Draw Period 8. Copy and paste the New Product page URL’s into the entry form. Only New Products are eligible. 5. Tell us in 250 words or less what this transformation would mean to you. 6. Once you have completed your entry for the week’s room or outdoor space, consistent with the theme for that week, you will be asked to share it with your social community to gain as many votes as possible. 7. At the end of each week during the Giveaway Period, with each week running from 5:00 p.m. Pacific Time (“PT”) on Sunday through 4:59 p.m. PT the following Sunday, the three (3) “finders” with the most social media votes during the week will be eligible to keep the products they found. Are you planning on entering?? If so share in the comment section which room you are entering and which pieces you hope to win. If you are not entering would you PLEASE help me win by voting for my outdoor area??? I will be sharing the links on my social network sites and would love it if you guys would hep me win.